Our Ezislider Garden Shed is a great solution for areas where space is limited. This smart design with sliding doors gives amazing accessibility and allows this shed to fit under eaves. The Ezislider is large enough to store tools, gardening or sporting equipment. W50 cyclone kit not available in this model. For permanent secure installation of your Ezislider shed, it is recommended to use anchors. To secure the wall panels to the concrete slab you will need 8 anchors for this 3m x 0.78m shed. 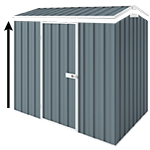 For permanent secure installation of your shed it is recommended to use concrete anchors. To secure the shed to the concrete slab you will need 8 anchors for this size.